I met with a member of Recorder Fontes’ community outreach staff today to get a better understanding of the changes they are making. The Democrats are very active and fully funded and have been volunteering in droves, recently doubling their County PCs from 759 to 1500. We have in my opinion, a great need to get Republicans signed up to volunteer to be part of the process to ensure integrity within the system. The County Recorder’s office requires ‘opposing’ parties to participate on Citizen Boards. These are the people who look at the mail in ballots and cross check each other’s work. One person will usually be a Democrat, and with low GOP participation, the cross checker will be a Green or Libertarian. We really need Republicans on these boards. Fontes’ office is limiting the duration of the shifts, they will no longer be 12-15 hours long with people sleeping in their cars. Poll watchers are absolutely still needed, but I think that, in light of the changes we are seeing, it is imperative that we get Republicans inside the process. Orientation Program- the Recorder’s Office is initiating on June 10th, Saturday from 10:00-Noon. In our efforts to professionalize and legitimize roles for those who are interested in helping the Recorder’s election efforts by; registering voters, helping at election sites, and as citizen board members, we have defined a program for everyone to attend. Phoenix, AZ – Arizona Secretary of State Michele Reagan today issued the official canvass of results for the 2016 General Election. The Secretary was joined by Attorney General Mark Brnovich and Chief Justice Scott Bales for the formal certification. Secretary Reagan reported 2.6 million Arizonans voted in the general election, making it the highest number of ballots cast in state history. While there were a historic number of votes, turnout was about average at 74% ranking 6th highest in Arizona history. Demographically, women made up 55% of Arizona’s electorate while 18-24 year olds made up 6%. The average age of the Arizona voter is 55. Early balloting continues to grow and the rising number of provisional ballots has finally been stopped. The general election saw 73% of the electorate vote by early ballot, up from 54% in 2012. While the number of early voters continues to increase, the issuance of provisional ballots declined by 80,000 since the 2012 general election. “The reduction of provisional ballots is extremely good news, as it shows us our voter education efforts are working,” said Secretary Reagan. “In the last three presidential elections, the issuance of provisional ballots had increased every year. This particular election seems to indicate a new positive trend and I hope it continues. You can also view the official election canvass here. Phoenix – The latest voter registration figures have been released and according to Secretary of State Michele Reagan, the number of registered voters has grown to 3,299,906, an increase of 47,219 since the last report in July. Of the state’s 3.29 million voters, 34% are Republicans, 28% are Democrats and 36% have either registered with independent parties or not designated a party preference. Libertarians and members of the Green party make up a little less than one percent of the state’s total registration while the Americans Elect Party has enrolled 500 voters since joining the state’s other recognized political parties in 2011. “I’m pleased to see the number of registered voters increase by more than forty thousand,” said Secretary Reagan. “As the state gears up for an exciting 2016 election cycle, including a presidential election, I’m confident our registration totals will continue to grow. The latest voter registration figures compiled by county, congressional district and legislative district are available on Arizona.Vote, this link http://bit.ly/1ku1CAg or by calling 1-877-THE-VOTE. I’ve often said that the best part about campaigns is that they actually end and you know if you won or if you lost. Needless to say, it’s also the worst thing about campaigns – particularly when you come up on the losing end. Such is the case of Justin Johnson for Phoenix City Council. First, let me say, Justin Johnson was the hardest working candidate that I have ever worked with. He was the first one up in the morning and the last one out at night. He was willing to talk to anyone and meet with whoever wanted to meet with him. His willingness and dedication to knocking on doors, making phone calls, raising money is amazing. He (and his entire family for that matter) has an uncanny special talent for hard work. When he started the race, he had 6% support and he ended up earning first place in the August election. Our internal polling had the Johnson campaign up by high single digits going into August. The final tally, however, was much closer, and foretold of things to come. What we found were several hundred West Phoenix voters who fell outside of the traditional participation model had made the run off much closer than anticipated. We adjusted our model accordingly and expanded the universe. Once again, polling showed a lead for Johnson – confirmed not only by our internal polling, but also in the Lake Research Polling for the Independent Expenditure formed to bolster Pastor and attack Johnson. We knew the run-off was going to be difficult – Congressman Pastor has deep roots in the community, extensive fundraising capabilities, and is probably the most liked official in all of Democrat politics. The Democratic establishment lined up in uniform support for the Pastor campaign and went to work attacking his Johnson’s Democrat credentials (and you thought it only happened amongst Republicans). As the Lake Research Polling suggested, the “IE needed to define her opponent quickly and aggressively.” That they did. The IE spent hundreds of thousands on mailers attacking Justin’s character and falsely aligning him with tea party interests. Despite all of that, Johnson still held a narrow lead. In the end, it came down to ballot collection. As returns came in, a similar trend emerged that was reminiscent of the run off. Another massive increase in early ballots (over and above August turnout) was seen from West Phoenix precincts – 311% participation from Holmes, 167% participation from Culver/Marivue, 146% participation from Acuna/Lynwood/Riverside, 142% from Granda/Madrid and 162% participation in Hayden High/Isaac/Lewis. To their credit, Johnson’s campaign took on the herculean task of trying to counteract that flood of ballots all the way to the end aggressively generating returns of their own. They spent every moment turning out their voters and reminding their supporters to vote. Their efforts are why turnout is up across the board from August. IEs on both sides made things messy and certainly made it a much closer election. However, in the end, with 30 days of early voting, the results may not come down to mailers, endorsements, or even party ideology. As we have seen more and more in close election contests, the daily grind of strategic ballot collection (particularly in low efficacy partisan targeted areas) can spell the difference between a win and a loss. Independent voters still tend not to participate at anywhere near the levels of partisan voters, and most seem turned off by the entire process. Paul Bentz is Vice President of Accounts & Strategy with HighGround Public Affairs Consultants. PHOENIX – “It is common sense that since you must be a citizen to vote, you should be required to show proof of citizenship before you register. Prop 200 was a common-sense solution to this problem and I commend Attorney General Tom Horne for defending the law. I am troubled by Justice Scalia’s assertion that Arizona still has ways of getting the job done by asking permission from the Elections Assistance Commission. He pointed out that in recent years Louisiana requested and was granted such permission. Yet today, that commission has no members, making it impossible for Arizona to seek such relief. Should the commission ever regain voting members, Arizona’s Secretary of State should move to immediately secure such permission. When I talk to Blue Collar workers I have found many of them do not spent much time following politics. They rarely know how government works from the federal level down to local government, yet they have a common thread as they often tell me, “Republicans ONLY care about the Rich.” It always breaks my heart to hear this because I know that it is the furthest thing from the truth; yet, a lot of the Blue Collar workers I meet truly believe this from the bottom of their hearts. I could go back and explain how we got to this point, and I used to try. However, I find that I usually lose them as I dig into American political history. Lets face it, unless you’re really plugged into politics, a 10 minute dissertation is way too painful to the average “non-political” Joe. This is where our challenge lies. How do we educate, but not lecture? How do we be informative, but not come across as combative, arrogant and preachy? How I have started talking about Republican economics is simply to tell of my Blue Collar struggles and their paycheck. Long ago in Ohio I worked with my cousins and friends in the construction field and I found that it was a trade that would suit me. Soon after, I started to work for a masonry company and went to masonry school to be a brick, block and stone mason. A few years later I started working for a General Contracting company, and started to make the best money of my young life. One afternoon the boss asked me to work a Saturday to help keep a project on track and enticed me by saying, “I will pay you time and a half!” I jumped on the opportunity. I had taken economics in school and thought I understood government taxes, but that day solidified my realization that I deserved the money I worked for, not the government. I have always believed that taxes were the ultimate win-fall for the government, but now I knew how unfair the system was. I had worked hard, negotiated my wages, put in extra time, yet now that I had worked one day more the government needed more of my money. I remember thinking, that was MY money, MY time and I earned it; not the Government. From then on whenever my foreman asked me to work on Saturday, I always said that I had prior plans, and couldn’t. This in turn, made the projects we were building take longer, stalling the projects opening and thus slowing the growth of the economy in our small town. There was no financial gain for me to work harder, so why would I; especially since the additional work actually accounted for a loss to my paycheck. If I would have gotten the　paycheck with the extra money instead of extra taxes; my wife and I would have supported a local restaurant, tipped the waiter/waitress a little bit more, and probably spent a little more money at the store. All of that was taken out of the local economy, because I refused to work harder to earn less. As I moved through my life and I became a business owner. I found this reasoning also applied to business. With a normal business plan, a business strives to reaches different levels of success in order to reinvest into its self. Whither it is more efficient tools, a larger facility, or more employees; a business is reaching for higher benchmarks. During this struggle to grow, they always have to account for the constant draining of funds being pulled away from the business via the government and taxes. This constant draining is a roadblock that every determined job creator has to jump over to be successful. Democrats try to put blinders on low-income employee to say, “the other guys can afford to pay a little higher taxes.” However, many times the ‘other guy’ in this statement is their employer or a corporation that with the ability to keep a bit more of THEIR profit could hire more employees. Just like when I couldn’t spend MY money on MY family with MY earnings, a company getting a higher tax bills can not spend or invest their money in their company, through pay raises (to the Blue Collar Workers), new equipment, or new employees. These financial hurdles and roadblocks hurt Blue Collared Workers yet, the Democrats consistently want to raise taxes on income and businesses that directly impact Blue Collar Workers. The Democrat Party says it’s a huge supporter of the “little guy”　and the “Blue Collar Worker”　but then their economic plan completely rejects this point. Anyone who wants people and businesses to pay more, because of their hard they work cannot say they want everyone to succeed. This makes the Democrat platform either completely disingenuous or completely inept to basic capitalistic principles. When I tell this story to Blue Collar workers, I watch as they put it into perspective and see the basic logic and reasoning. Many Democrat candidates demonize corporations, big business and “the Rich.” In all actuality they are really demonizing every worker who wants to work hard to succeed for their family. Every worker should be able to work hard to support their family and every corporation needs to work hard to reinvest into itself. This is how Republicans view the economic development with tax cuts in order to spur economic growth. President Ronald Reagan implemented this strategy when he cut taxes across the board and created a boom in the economy in the 1980’s. He so eloquently said, “A rising tide floats all boats.” When I try to start with this quote, I am always accused of　defending the “rich guy.” But when I start the story from the beginning, I find that this quote is a great closer because by then nearly all my Blue Collar friends have realized that Republicans are actually the party for the hard working Blue Collar workers, not the Democrats. About the Author: Aaron Borders is a Financial Specialist and business owner in Arizona. Aaron was a Journeyman Mason and partner in a General Contracting and Construction business prior to the 2008 market crash. He got the proper education in order to help families and businesses with their Risk Management and Financial needs. He lives in Litchfield Park with his wife Shelly and three little boys, with a baby girl due in Sept. Aaron Borders is also a candidate for the Arizona House of Representatives in Legislative District 29. For more information on Aaron, please visit his website at www.AaronBorders4AZ.com. Anyone looking for proof that Arizona’s districts are gerrymandered need to look no further than this month’s election results. Republicans were incensed months ago that AIRC created districts helping the Democrats. Of course Democrats tried to argue that they were fair, but numbers don’t lie. In Arizona a total of 2,015,330 votes were cast for either a Republican or a Democrat in the congressional races (CD07 did not have a Republican congressional candidate, so not including the Libertarian- the non-Democratic vote- helps the overall Democratic totals, but for simplicity we will only look at Ds and Rs). Of those votes, 1,102,513 were cast for a Republican and 912,817 were cast for a Democrat. Republicans received approximately 200,000 more votes than Democrats (189,696). That means that Republicans received 55% of the two party vote total. So what does that mean? It means that if we were to completely randomly select voters to be in 9 districts across Arizona, we would have 9 Republican representing us. Yep, with 55 percent of over 2,000,000 people voting Republican there is an 83% chance that every single representative would be Republican if we randomly put voters in districts. Instead we have 5 Democrats and 4 Republicans. It means that a Republican vote in Arizona is worth less than a Democratic one because of how the districts are created. Of course, we wouldn’t randomly put voters together because that would mean that we would have voters from Tempe, Tolleson, Tucson, and Tuba City all in the same district. However, even if you created 4 Democrat districts and 4 Republican districts, the chances of accidently creating a majority democratic delegation are less than 2%. There is almost a 99% chance that we would have 5 Republicans. The chance of having more Democrats than Republicans is outside what we would generally consider within the margin of error. The point? Having 5 Democrats representing Arizona would not occur by accident unless you were specifically creating the districts to make that outcome a possibility. Soooooo, it means that in Arizona we are not being represented in Congress by people who believe like we do. We have allowed an unaccountable organization to decide that some amorphous idea like “competitive districts” is more important than having representatives that actually represent us. 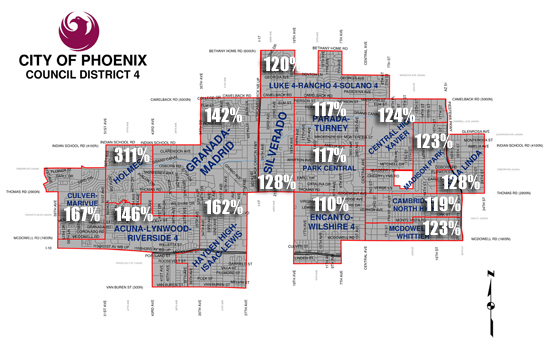 The Arizona “Independent” Redistricting Commission- gerrymandering at its worst. “As part of our final get-out-the vote effort, the Flake for Senate campaign put in motion a telephone call operation designed to contact 120,000 Arizona Republicans to ask them for their support and to direct them to their proper precinct. In the course of this massive operation, there were apparently a few errors ineither the person’s party preference or correct number. “Five individuals have complained, resulting in the overheated rhetoric and a complaint, neither of which is surprising in light of the Sunday survey by the Democratic-leaning polling firm PPP showing Jeff Flake leading his opponent by five points. “The KPNX story that prompted this was incomplete, and really made no sense since the calls were made to 120,000 registered Republicans and encouraged them to vote. The station elevated breathless insinuation over the real explanation for a handful of mistakes caused by some adult children registered under their parents’ address, voters who had moved but not updated their registration or incorrect phone numbers in the database. The station failed to note that Flake for Senate worked with and consulted county election officials in compiling the information for our supporters about their correct polling location. Attached is a document detailing each case cited by the Arizona Democratic Party along with a response from the Flake campaign that sheds light on why the voter may have been contacted erroneously.